Dispatches of Harsh Mander who is on a journey across India to raise awareness about lynchings. After a one-day break, the Karwan-e-Mohabbat regrouped today (September 12) in Delhi, for the 10-day bus journey, travelling through four states, meeting families who have been destroyed by hate violence. We gathered in the morning at Ummeed Aman Sneh Ghar at Qutub, travelled to Raj Ghat to pay tribute to the memory of Mahatma Gandhi, and then to Tilak Vihar, where the widows of the 1984 Sikh massacre were settled more than three decades back. For a karwan that seeks to reach out to those who have survived hate attacks to offer solace and solidarity, we felt it was most important to remember an older painful history of communal and caste massacres through the 70 years of India’s freedom. The largest of these brutal communal massacres was in Delhi in 1984, in which more than 3,000 Sikhs were massacred on the streets of Delhi. Thirty-three years have passed since, but the working class widows of the massacre who were settled here continue to grapple painfully with memory, penury, and their children with mental health and drug problems. What rankles them all these years later is also the deliberate subversion of justice, as few of their attackers and fewer of those who organised the carnage have been punished. In the large gathering that greeted the Karwan at Tilak Vihar, many speakers recalled that painful history. Many of the residents of Tilak Vihar had written cards with messages and hung them on strings. In one of these, a 1984 widow wrote that she wished that no one should ever have to suffer the way she has. People said that they worried deeply about the rise of hate violence all across the country. 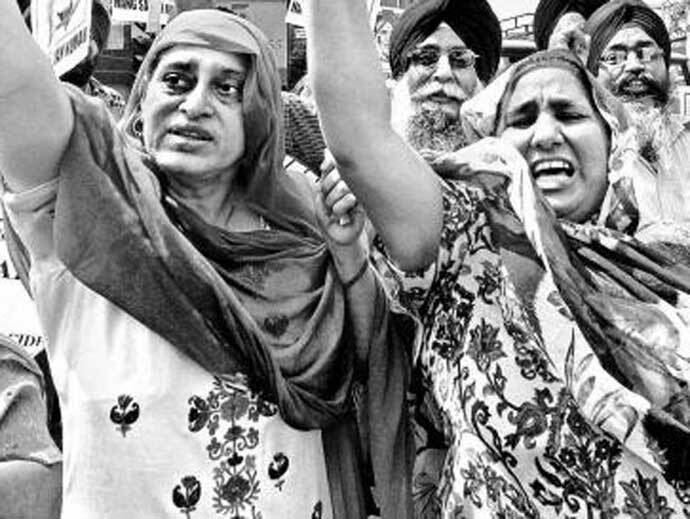 They hear of men attacked, savaged and burnt in their homes and on streets, and this brings back frightening memories of what happened on Delhi’s streets and in trains in 1984. They called resoundingly for a country in which people of different faiths live together with love and peace. Many singers and poets sang hauntingly of love and peace. Children of Tilak Vihar and of the street children rainbow homes also danced and sang. Sonam Kalra, Dhruv Sangari and Shweta Tiwari sang luminously the poetry of Bulleh Shah, Faiz Ahmed Faiz and Javed Akhtar. There was poetry by Adnan Kafeel, Devesh and Suraj Tripathi, and dramatised readings by Fouzia, Syeda Hameed and Lokesh Jain. The youthful Savitri Phule Band also sang, and the children of Tilak Vihar had to conclude with a bhangra. At the end of the evening, those who had volunteered to join the Karwan were invited onto the stage. There were a wide range among them, of writers, journalists, students, filmmakers, photographers, lawyers, social workers, teachers, priests, health workers and scientists. They sang one song about love together, ate langar at the gurdwara, and then set out late in the night for the next halt at Shamli in Uttar Pradesh. Writer is a human rights and peace worker, columnist, researcher and teacher. He works works with survivors of mass violence, hunger, homeless persons and street children.